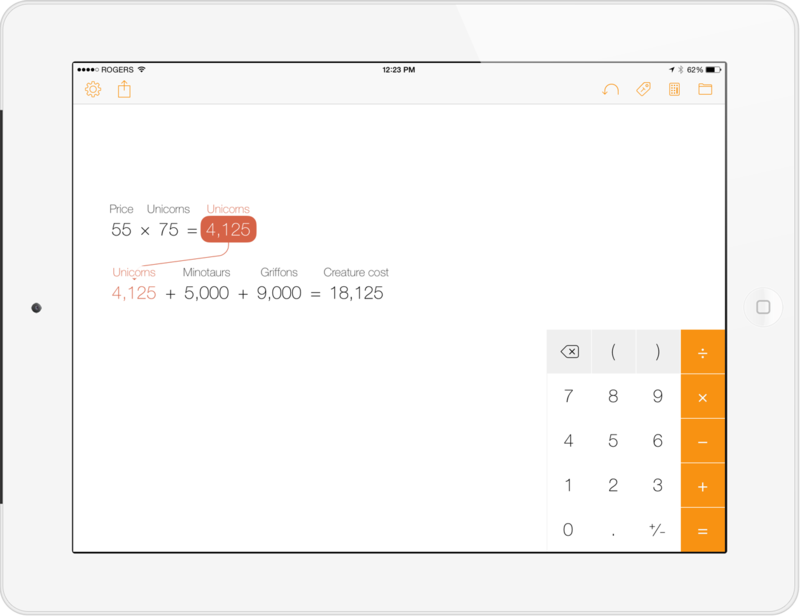 Tydlig is the calibre of calculator goodness that the iPad canvas deserves. Most of its graphical and scientific functions are more powerful than I ever have need for — but even a layman like me can appreciate how beautifully it blends calculations with the free-form flexibility of a whiteboard. I think it’s downright silly that there isn’t a default calculator app on the iPad, but if Apple does eventually get around to designing one, they should be aware that the bar has been raised. The combo of text labels, linkable numbers, and an infinite canvas provide great ways to visualize and check sets of numbers. Using Tydlig to do a quick calculation of “55 * 75 = 4125” works like it would on any other regular calculator. The magic happens when you start labeling and linking individual factors. I’ll add the label Price to “55” and add # to “75”, which provides context for the equation. I can then label “4125” as Unicorns and tap-and-drag it to create a link to it, and then add it to my growing tally of mythical creature costs. If I’ve made a mistake anywhere in my calculations, I can go back and adjust a number and have all of the totals re-adjusted automatically. So far Tydlig has helped me break down budgets and restaurant bills, but I can also see it helping me examine reports at work in a quicker and more tactile way than a spreadsheet. This app has displaced Calcbot as my calculator of choice across both my iPad and iPhone, and there’s no question it’s worth more than the $2 asking price.